So, Thanksgiving is essentially upon us. Black Friday draws near. Christmas songs are playing. It's that time of the year again . . . So, anybody have any special plans or anything? Me? Eh, not much, really. I'll prolly just head on out for a little bit on Black Friday, just for a change of pace. I'm not a voracious shopper, but I'll occasionally snag a deal on something for the hell of it, and if the opportunity arises . . . Like how I picked up Red Dead Redemption last year at my local Target. I was just minding my own business, with a cup of coffee in hand, walking through the remains of what once was your average Target store. Empty HD TV boxes and paper bags littered the place, and rabid little children ran amok everywhere. It was the worst. But still, I set out aimlessly to encounter whatever good fortune I might find amongst this storm . . . And there, on a shelf, sat Red Dead Redemption. It wasn't alone, since GTAIV and LA Noire both accompanied it. And really, RDR wasn't set aside for any special reason. It wasn't special to me at the time, after all. It was just another game I hadn't played yet, and $20 seemed like a fair deal. I whipped out my phone, and texted a friend. TUT: Oi, what should I get? Red Dead, GTA or La noiry? TUT's Friend: Erm, get RDR. You'll like it more than the rest. And thus, with that simple text I made my choice. I picked up some doughnuts on the way back home, and heated up some leftover macaroni and chicken for dinner. It was just me, the game, and a fleeting afternoon. About a year later, here I am. 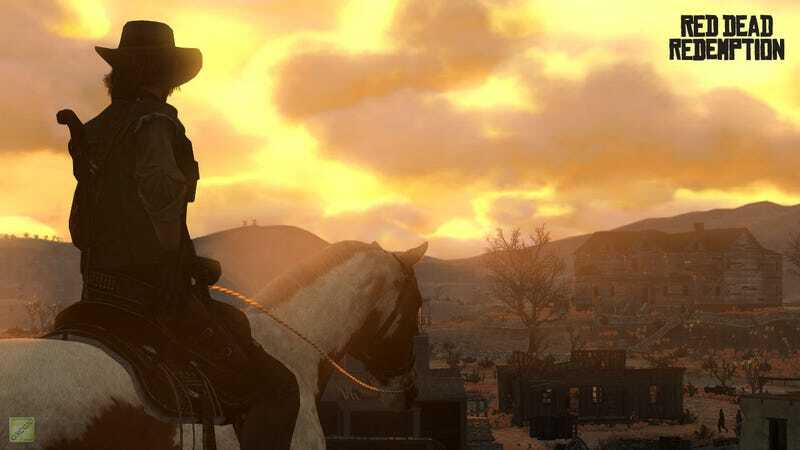 RDR is one of my favorite games, and one of the best impulse purchases I've done. The aforementioned friend and I drifted apart, but it doesn't matter because life goes on, and you meet new people. I've met all you, after all. And well, a lot has happened in this year. I know it's a bit too soon to call it "over", but the nostalgia of yesteryear makes me forget about that, and I start to reminisce. Even if things aren't too different now. I wonder what I'll pick up on impulse this year, and what I'll have for dinner this Friday. But I really hope it's something memorable, since I like to reminisce. So, what about you guys? Has the holiday spirit gotten a hold of you yet? The month's almost over, but you can still add to the TAYlendar! Uhm . . . The Game Night link is supposed to be here, but since it's the holidays, we're not having an official one! Instead, check out our Steam MulTAYplayer group! Prolly gonna get flak for this, but Aikage says goodbye to his old workspace. Go down there and give him a hug. I mean, who hasn't felt like that before? Also @ Aikage-kun . . .
And since it's almost Thanksgiving, I figured I may as well gift you guys a little bit of music, instead of my usual random link of tomfoolery. Enjoy!